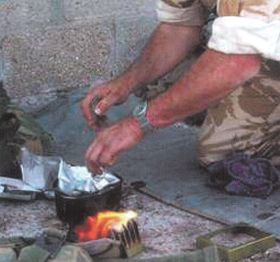 The quality and shelf–life of food supplied to armed forces personnel is essential in their well–being. For over 10 years we have provided services to the Defence Food Services Integrated Project Team, on behalf of the Ministry of Defence (MoD), in support of their quality assurance management for the United Kingdom Armed Forces. A vital part of this work is to provide specialist advice on food, packaging and legislation issues for specifications used to guide companies tendering for contracts to supply products. We subject these products to sensory profiling, microbiological and nutritional analysis, and rigorous integrity testing of packaging. We also monitor shelf–life of a variety of ambient stable foods stored in readiness for distribution across the world. This ensures that the food supplied is safe and that quality is not compromised. Richard Hatton of the MoD commented: "We have built up an excellent working relationship with Campden BRI over the years. We originally commissioned them to do this work in the late 1990s and we have been so pleased with how it has turned out that we were more than happy to extend the contract in 2010. Their particular advantage is that they can combine so many areas of expertise – from legislation, through packaging and processing, to sensory analysis – under one roof. And they can pass on their knowledge in many ways – including through some highly informative and interactive training seminars. One particular area that is important for us to consider when providing food for those on active duty is that of food allergy and intolerance - another area in which Campden BRI excels."